Eleven sections give us the ordinary rite for Communion. Rather than post the whole texts, I’ll offer some highlights and observations. The Liturgy of Holy Communion begins with the Lord’s Prayer (87). In section 88, there is an alternate text for the “showing” of the “Eucharistic bread,” This is the bread of life. Taste and see that the Lord is good. Clearly, not so squeamish about using meal and food imagery in the rite. May the Lord be with you to protect you. Amen. May he guide you and give you strength. Amen. May he watch over you, keep you in his care, and bless you with his peace. Amen. And a lay minister would use a different invocation, signing themselves and using the blessing with the first person plural reference. The ordinary rite seems rather heavy on the introductory rituals, with the options for a lengthy penitential rite (including the Confiteor), and a sprinkling rite. This is especially curious, given the four suggestions for one-verse readings. I wonder how ministers over the past two decades have handled this. No inclusion of music, not that all pastoral care ministers are capable of leading song. 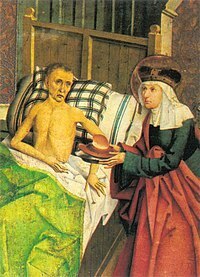 The meal aspect of Communion seems emphasized, particularly along the thought that Eucharistic nourishment is a source of strength and healing for the sick believer.